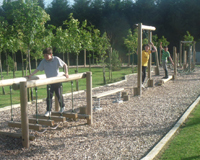 The obstacle course is a real challenge for the older kiddies, it requires a lot of balance, co-ordination and skill to get across without making a mistake along the way. Great fun and the younger kiddies enjoy it too. Climbing Tower reaches a height of 22ft and the kids love it the higher the better and guess what, we have two towers, so you can race your friends to the top and back down again……Serious Fun….